Sorry, your browser seems not to support HTML5 video. 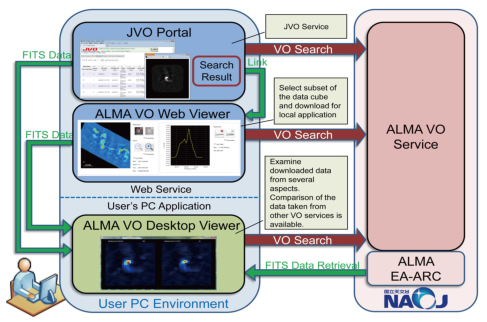 We are happy to be able to announce product release of ALMA VO Service, which has been under development in a joint collaboration of the Japanse Virtual Observatory (JVO) and ALMA-J teams at National Astronomical Observatory of Japan for years. 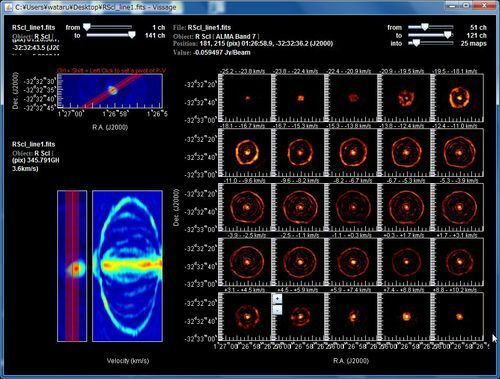 This service mainly consists of two software named ALMAWebQL and Vissage to enable users to review huge ALMA data cubes through Internet without large data transfer. ALMAWebQL is one of the components of JVO portal site; pushing “Web QL” button in a search result page launches ALMAWebQL, and you can interactively visualize each ALMA data cube in a web browser. This web application enables you to cut out your desired region in the data cube and download the segment of a full data cube to your computer. 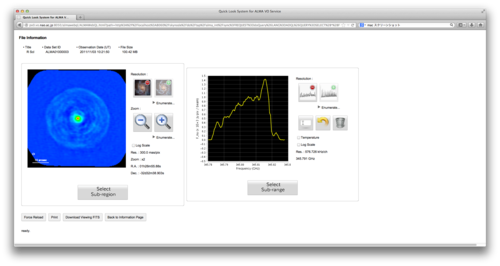 Vissage is a Java-based desktop viewer for ALMA data cubes. The most important feature of this application is to work closely with JVO portal site including ALMAWebQL, while the application of course can visualize standard FITS files such as HST, Subaru, and Chandra. You can visualize the data cube obtained with ALMAWebQL in detail, and also directly revisit the search result page where the FITS file obtained and get another data cube with different cut-put parameters again. selecting and grabbing a sub-region in directions of space and frequency to obtain more detailed information. Clicking “Download Current FITS” button invokes the cut-out service to download a (3- or 4-dimensional) image FITS file as is displayed on the screen at the time. You may load Vissage with these FITS files for more detailed analysis. Technically, ALMAWebQL is built on the customized GWT: some mathematical classes and GUI components related to HTML5 are appended. In addition, the just-in-time endian conversion algorithm implemented in C++ language is applied for much faster data processing. Vissage (VISualisation Software for Astronomical Gigantic data cubEs) is a browser for FITS cubes. Motivated for showing data cubes from ALMA though, it is being designed and developed as a general FITS browser specialised for data cube and VO connection. Unlike ALMAWebQL, Vissage is a standalone application and can be downloaded from here. Vissage runs on any OS which supports Java (JRE 6 or newer is required). After downloading an ALMA data cube from JVO or ALMAWebQL, you can open it with Vissage and look it in more detail, in a variety of ways including moment maps (1st and 2nd), flipbook (just like you can do with ds9), channel map and P-V diagram. When viewing ALMA data, users can seamlessly connect back to ALMAWebQL and JVO from Vissage. Another uniqueness of Vissage is an easy handling of multiple images (see the figure). Users can view several 2D images and cubes from various telescopes including ALMA, NRO45m, Spitzer, Subaru(MOIRCS and Suprime-Cam), HST and Chandra, with flexible layout. Being still preliminary in functionality and in user interface, Vissage has a long list of future development to become more useful gadget to handle data cubes.